Let’s face it: Russia is not the right country for white collars. And white jeans. And white t-shirts. And any white clothes at all. Because Russia is freaking dusty. If you don’t mind washing your white clothes every day, then OK, put your white jeans on and go for a walk, but don’t complain that I haven’t warned you. When you come back home you’ll see stripes of dirt in your favourite Levi’s. I don’t mean that Russians are dirty or that you don’t have to wear white stuff when visiting Russia. Dust is a real problem here, and this is a by-product of the infrastructure — bad roads, lagging technology and, quite often, poor city management. In Summer, if it is dry and hot, dust is everywhere — on roads and grass, on cars and buses, on benches and shop windows. When it rains, dust becomes mud. Why it is so dusty here? 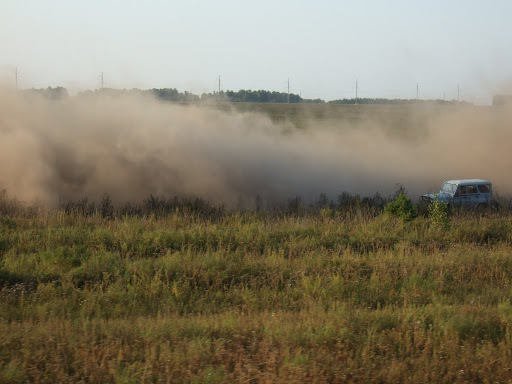 In Russia, it is partly there is a large gap between road and grass, and the soil becomes dust easily. I don’t know why, but Russian cities lack good lawns. Even cultivated lawns have a lot of bare soil. The biggest surprise to me was to see thick grass or wheat fields right near roads in Europe, with no centimeter of deserted land. The next shocking experience was to see snow-white trucks with oily-black tires. In Russia, the normal color of trucks is … yes, dusty-grey. In 2000-2008, Russia was experiencing a construction boom. Unfortunately, construction technologies in this country leave a lot to be desired, so construction sites are another major source of dust. In Toronto, Canada, I saw pouring trucks cleaning roads while workers were maintaining the pavement. One guy was demolishing the old pavement, and the special truck poured water in order to keep the area clean. I hope, one day this technology will be adapted in Russia too. What amuses Russian tourists in Europe and North America is that people there often sit right on the ground. Even in white jeans. “It is so clean there, that people sit right on the ground, can you imagine that?” is one of the most common phrases Russian tourists say to their friends when coming back home. Please never try to sit on grass in Russia. First, people may think, you are a homeless and antisocial person. Second, you’ll hopelessly dirty your pants. This is kind of an acquired instinct here to not sit on the ground. I live in a very clean town. We have large flowerbeds here, no garbage in bushes, and very rarely there are dog feces on the ground, but still my shoes get covered with dust after every walk. Once my Russian habit of taking my shoes off when entering somebody’s home surprised my European hosts. “Are you from Japan?” they asked me, smiling widely. Oh, this habit has nothing to do with etiquette or spiritual traditions. Russians put shoes off because we believe deeply in our hearts that home is clean and the outside is dirty. When I was to very clean, nearly sterile Germany, I still put my shoes off every time I entered my guest apartment, though I knew well that the outside there was as clean as the inside. And yet, I love wearing white clothes in Summer. It is stylish, it reflects sun rays and keeps the skin cool. I just know that I need to wash it every time I wear it, which is not a big problem.